The Altronix ALTV2432600CB Power Supply has been discontinued. No direct replacement is available. Used to power CCTV Cameras, heaters and other video accessories. 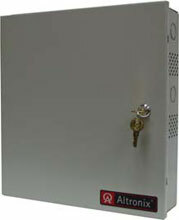 The Altronix ALTV2432600CB Power Supply is ideal for powering CCTV cameras, heaters and other video accessories. It provides 24VAC @ 28 amp (700VA) or 28VAC @ 25 amp (700VA) supply current. ALTV2432600CB Power Supply features an illuminated master power switch with built-in circuit breaker. It has surge suppression and AC power LEDs.